The Brookings Arts Council was pleased to recognize the winners and their works, Thursday, August 2, 2018 in the Main Gallery. Artists from across the state vied for the ability to have their works juried in and to then compete for the prizes. Brookings painter, Meghan Peterson won second with the painting titled, “The Gathering,” while Jessie Rasche of Brookings garnered third place with her oil on canvas work, “Breakfast in a Spring Thaw.” Fourth place went to Sioux Falls artist, Karissa Meyer with her mixed media work titled, “My Grain Brain”. Honorable mentions went to Brandy Fenenga of Watertown for her colored pencil piece, “Sable Christmas” and to Danna Kolbeck of Mitchell for her mixed media work, “Divine Sun”. Thirty-nine pieces vied for top honors. “We are thrilled with the creativity and the pieces met with our expectations and high standards. Our juror, Dr. Greg Blair, an Associate Professor of Art and Art History at Northern State University, had very difficult decisions to make and he offered wonderful insight to the artists and attendees on his choices.” Executive Director Heather Kuhlman commented. Cash prizes were awarded for first, second, third and fourth prize at the opening reception that was held, Thursday, August 2 from 4:30 to 6:30 at the BAC, 524 4th Street in Brookings. Refreshments were served. The exhibit is open to the public through Friday, August 24th. There is no admission charge. The Brookings Arts Council is open Tuesdays through Fridays, Noon to 5. 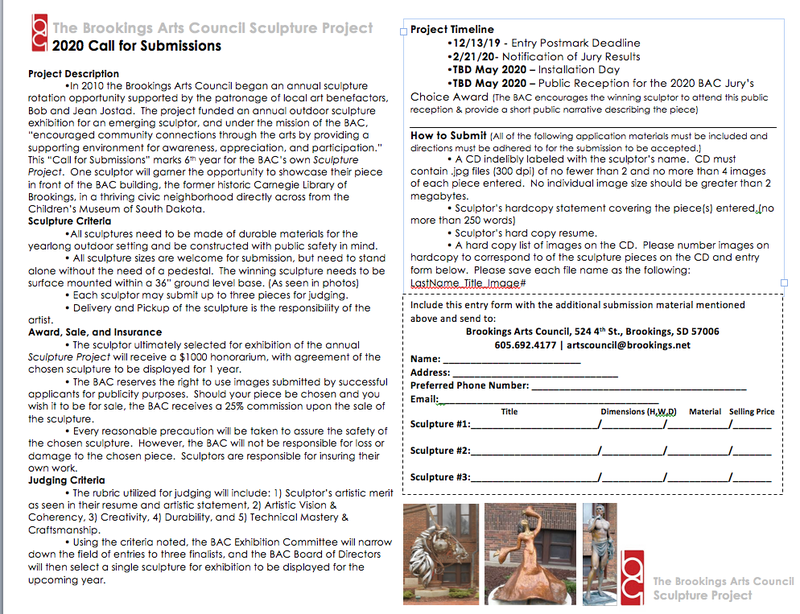 For more information, contact 605-692-4177, email at directorbac@swiftel.net or the website at BrookingsArtsCouncil.org.